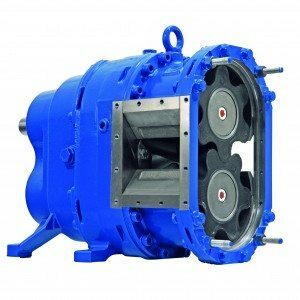 Vogelsang Lobe Pumps are industrial pumps designed for waste water and general industrial applications. They are not to be confused with the more delicate stainless steel hygienic lobe pumps! They have heavy duty cast iron bodies and rubber lobes which makes them ideal for pumping sludge and other similar liquids. Can dry run for limited periods of time. Can pump heavily aerated liquids and high viscosity liquids. Easy to maintain with all normal wearing parts able to be accessed with the pump in-place by removing the front cover. Helical lobes for reduced pulsation. Heavy duty silicon carbide cartridge seals. Vogelsang pumps are ideal for pumping both thick and thin liquids with varying levels of abrasion. Sewage sludge and HFO (Heavy Fuel Oil) are common liquids.